Quinn's pub closed after All Ireland due to "grave and immediate danger to public health"
The pub was issued with a closure order by the Food Safety Authority that was lifted two days later. 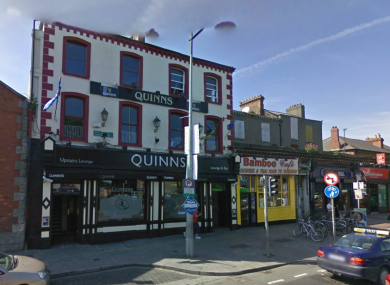 QUINN’S PUB IN Drumcondra was closed by the Health Service Executive for two days after the first All Ireland hurling final. The pub’s closure was one of 12 that was ordered by the Food Safety Authority Ireland in September under rules that deem there to be “a grave and immediate danger to public health”. The closure order was served on Quinn’s under food safety legislation on Monday 8 September, the day after the drawn All Ireland hurling final between Kilkenny and Tipperary. It was lifted two days later. A prohibition order was served on Quinn’s on the same day telling the company operating the favourite GAA haunt to withdraw all foodstuffs that were stored in the basement cellar. This included a stipulation to remove bottled drinks stored in the basement. All foodstuffs that were stored in this area at the time of the inspection remain prohibited from sale. The pub is one the most popular meeting spots for GAA fans because of its proximity to Croke Park and is regularly extremely busy on match days. A spokesperson for the FSAI said that the closure was triggered by an inspection at the premises and was put in place immediately. A follow up inspection allowed the closure order to be lifted after issues that were raised were sufficiently addressed. The spokesperson could not confirm whether the inspection was carried out as a result of a specific complaint but said that complaints against different premises “are made regularly”. Premises on which an order is made are place on an FSAI watch list and follow up inspections are made. Consistent reoffending can result in prosecutions according to the FSAI spokesperson. Email “Quinn's pub closed after All Ireland due to "grave and immediate danger to public health"”. Feedback on “Quinn's pub closed after All Ireland due to "grave and immediate danger to public health"”.